I used a pastel plaid cotton throw that I keep on the porch rocker Spring and Summer. Today is cold and raw, but they say we will be near 60 mid week! The only thing new on this table is the covered bowl and the napkins. I got the bowls in CTS for 1.60. They will be perfect for our soup, or even baked oatmeal Easter morning. I have seen them for waaaay more in other places, but I thought these were worth the price. one panel of tier curtains, 2 in a pkg marked down to .67! I knew as soon as I saw it I would use it in a scape. I have enough for 8 napkins, or 4 and a topper. I don't think you can get cheaper than that! The flatware is by Cambridge, CTS, the little potted egg place marker, the blue goblet, and the napkin rings, all CTS. Napkin rings were .25, Park Smith. 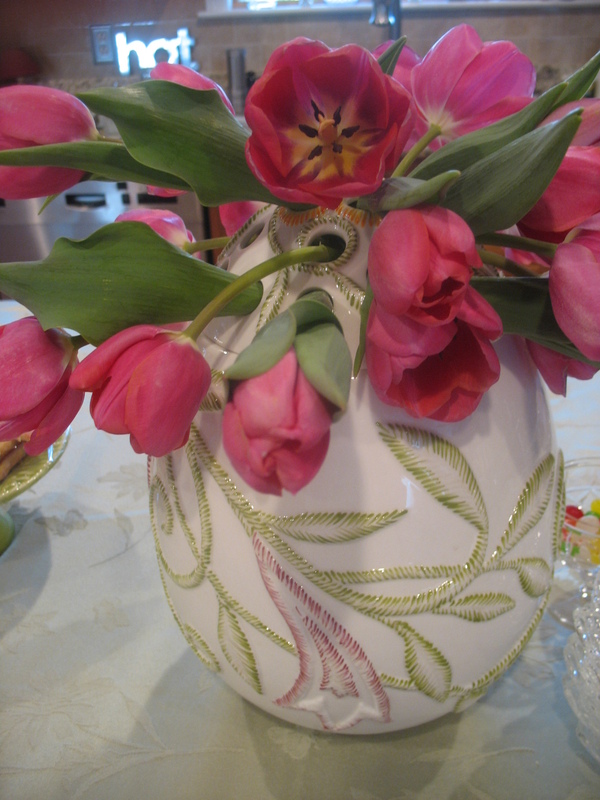 The centerpiece is from Villeroy and Boch. There are holes, (frog) in the top for the pink tulips. I have the large one too! I got it in the clearance section long after Easter and I think it was around 12.00. It is very large! The egg candles were from a long gone pre cursor to 99 cent stores, and they were 2/1 with the ceramic egg holder included. The pink stem is by Gorham via Lenox Outlet. as is the low cake pedestal filled with petit fours. White porcelain charger, mint dinner, $ Tree, baby blue salad from Pfaltzgraff clearance years ago. I think they were .50 I used a pink tulip doily under the covered soup dish. Just to throw some real Tartan into the Parade, I dug out my Tartan Bunny from Pottery Barn, and took some pics down in the basement! Excuse the darkness! I sat him in a wicker chair, used a tartan mat, black bowl and cup. The napkin ring is a pique rattle from PB, and I folded a matching plaid stocking to look like a napkin. Please come back Wednesday night at 7 PM for Let's Dish. Meeting # 3 ...sharing our collections of table related accoutrements stuff, and table settings too! All invited as long as you don't have word ID on your blog! Monthly Challenge, The Good Earth on April 18th! The early birds catch the worms! PSST, Gina is having a great give away! Go read about it here! Please tell her I sent you! I need the brownie points, :)! Just Hopping Along! Remember , Let's Dish Wed. at 7 ! Hard to believe it is so close to Easter! I barely have the St. Pat's put away, and the Bunnies are starting to hop out of the bin. Their cousins,the DUST bunnies , stay out all year! If your read the The Tablescaper's Seasonal Sunday post, you know we went shopping yesterday. No, I do! But I won't, as I haven't photographed it yet. But I did get some very pretty Hutschenreuther dishes. it , as it was a good price. When the clerk came over and said it was, buy one get one free, SOLD! I am talking GOOD prices! Now I don't buy 12 like my friend Alma and Cherry Kay, but I took what they had! I'll show you Wed for Let's Dish! Thanks so much to all of you who came over and linked or commented Wed night for the first meeting! So from lovely china, to cheap plastic at the Dollar store! I am working on a table using that tray as the charger, and adding some colorful plates. Hop to it! Easter is soon! Please come back Wednesday night at 7 PM and link up your dish related posts at Let's Dish! Last week Karen at Briarside Lane showed us part of her candlewick collection and explained the difference between that and Boopie! All of which I have only learned since blogging!